The beautiful Mozelle dress is a collaboration between Stokes Thompson and Melbourne designer Hanni. 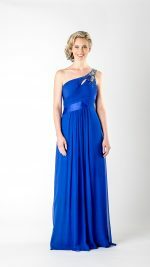 This gorgeous silk georgette strapless dress features small pleating over the bust to create a flattering detailed look. Small gathering under the bust gives the dress amazing fall and movement. If your size is not available please contact us or preorder the desired size. Perfect Ball or Bridesmaid Dress. Panels of Pleating Over Bust.